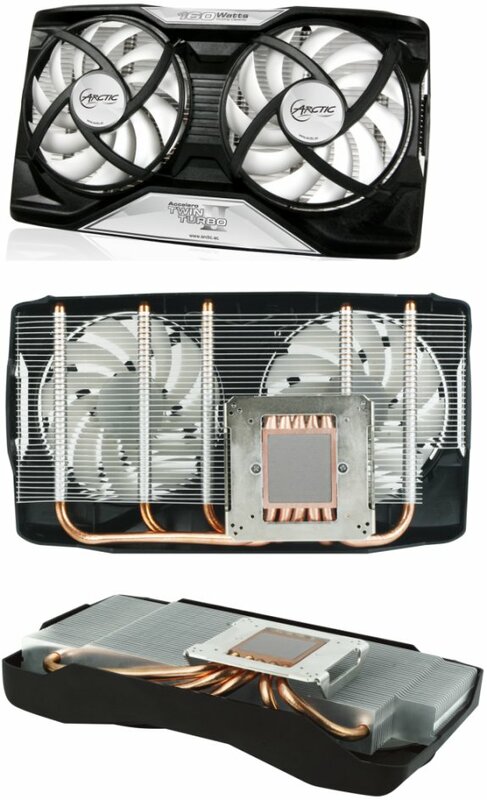 Arctic Cooling announced the Accelero Twin Turbo II, a new graphics card cooler with copper base, 35 aluminium fins, five heatpipes and two 92mm PWM fans with an airflow of 54CFM. The cooler is rated at 160W, which means top-of-the-line graphics cards aren't supported. It measures 217mm x 122mm x 53mm (L x W x H) and weighs 479g. ARCTIC is proud to unveil the Accelero TWIN TURBO II, a multi-compatible VGA cooler featuring uncompromised cooling performance with wider compatibilities. Designed for mid-range to high-end VGA boards, the Accelero TWIN TURBO II optimizes the overclockability for enthusiasts, gamers and high-demand users. Equipped with two 92mm PWM fans spinning up to 2,000 RPM, the Accelero TWIN TURBO II delivers generous airflow to cool down the GPU and surrounding components whenever possible. Heat from the GPU is transferred via 5 heatpipes and dissipated efficiently with the 35-fin aluminum heatsink. In order to extend the service life of the GPU, the ARCTIC MX-4 thermal compound is pre-applied at the copper base to increase thermal conductivity. Taking multi-compatibility at heart, the Accelero TWIN TURBO II is equipped with a versatile and intuitive mounting mechanism to accommodate a broad range of models at present and in the future. A comprehensive cooling set comprised of RAM/VR heatsinks in assorted sizes is provided to accommodate different VGA boards. Speaking of RAM/VR cooling, the Accelero TWIN TURBO II provides the user with G-1, an electrically non-conductive thermal glue for affixing RAM/VR heatsinks. Unlike thermal tapes, G-1 delivers excellent thermal conductivity and long-lasting adhesiveness, while removal of it is extremely easy without leaving residues behind. Thanks to the low noise impeller and patented fan holder, the Accelero TWIN TURBO II is virtually silent under all circumstances. As the PWM controlled fans run according to the load generated by the GPU, noise level is always kept at the minimum. Definitely another Best-Buy for cooling high-end graphic cards, the Accelero TWIN TURBO II comes with a 6-year limited warranty, with MSRP at $ 63.32 USD and € 44.54 EUR, excl. VAT.